Genetrade has all of the most popular devices used by traders today. The various offering can be found below. simply select the platform that is supported by your preferred device(s), download the platform, and follow the installation instruction provided. It wasn’t a hard decision for us to choose MT4 as Genetrade’s platform of choice. MetaQuotes released the MT4 platform in 2005, and it is still considered the industry standard. 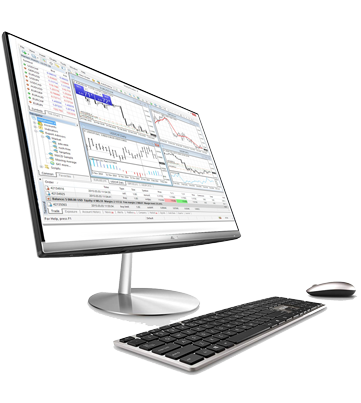 Ease of Use – For first time traders, the user interface is easy to navigate and understand. All the important information you need for a trade like prices, charts, and indicators are no more than a click away. Features – Once you understand all the features, you will see that you have everything you need at your fingertips. You will have multiple charts, Market Watch, Pepperstone Market, Indicators window, Automated Trading, pre-installed indicators, News, Signals, and 1 click trading to name a few. Customization – You decide what you want to see and where. Change the windows, arrange the charts and symbols to your liking. MQL4 – Having MT4 use MQL4 as it’s programming language gives programmers the opportunity to create their own indicators, trading robots, or Expert Advisors. Even if you can’t write code, you can easily find a programmer that can develop your own automated strategies. Reliability – MT4 works on your computer using very low resources. What this means is extra stability even if you are working with low internet bandwidth. This is also what gives quick reaction times when you are implementing your trade orders.